12 June 2014: What exactly does it mean to Edit??? Ugg! A real mess, I know. 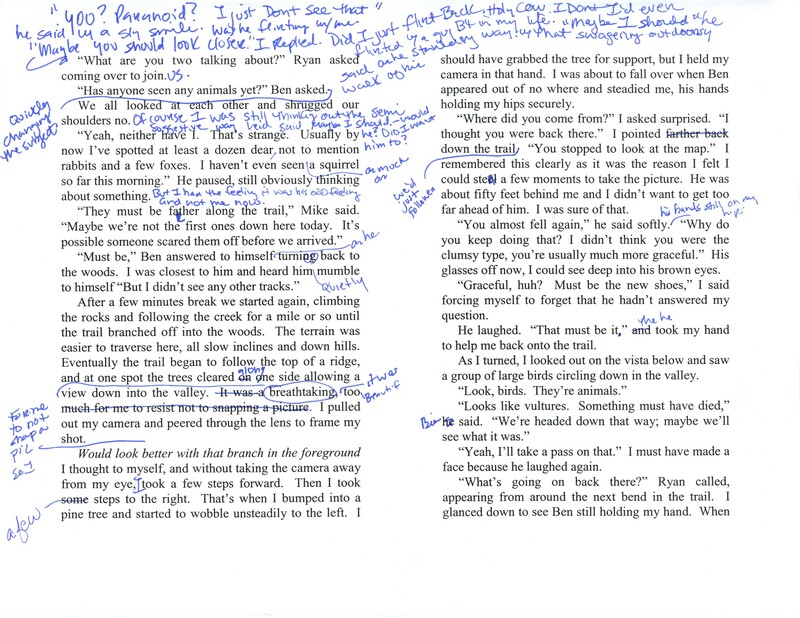 Like I said, I’m sure every author has a different process, but I just like to do my edits on paper to begin with. Don’t ask me why, I have no idea. I think maybe I just feel the creative juices more. So I start out by going through the entire book doing just this. Nipping here, tucking there, adding a bit more where needed. Then after all the changes are entered into the computer, I print out another copy and start again. I do this three times. Then I moved on to write the next novel in the series. Now after I finished the last novel, book 5, I went back to Book 1 and started the process again. Ugg! again. In this way, Book 1 was the most labor intensive to edit. This is because a whole year had passed since I’d written in. A year in which I’d been writing or editing for hours every day. To put it simply, I was a much better writer at that point than I’d been when I wrote it a year ago. The old saying is definitely true, if you want to be a better, write. Because of this, I think I did three and maybe a fourth paper editing pass on Book 1. This was around the time that I realized that if I wanted to sell E-Books, I should probably see what one looked like. Duh… So I bought my Kindle (and haven’t been parted from it for a day since. Addiction, never pretty in any form.) A friend told me that when she was editing her books (She’s a writer too) that she had her Kindle read them back to her so she could hear if there were any mistakes. I wasn’t sure how to do this and went on the KDP (Kindle Direct Publishing) chat rooms and asked. I got a lot of weird responses like why on earth I’d want to do that and what a waste of time. Well, those folks are fools because I found tons of mistakes that I’d never have caught otherwise. Hearing my Kindle’s monotone computer voice read my book back to me made ever mistake pop out in vivid 3-D where my eye (which at this point had read the book 6 times other than the first time when I wrote it) just skipped over them. Just to pass it along, every Kindle has an address. Generally, it’s the beginning of whatever email you have for your amazon account but with @kindle.com at the end, but you can look in up on your kindle as well. You format the book like you do your E-Book version and attach it to an email to that address. Once received, it appears as a document on your Kindle that you can open and not only listen to, but edit on as well. So after the paper edit, I did four passes of just listening to the Kindle read it to me. After that I was done … until I moved on to Book 2 (repeat all of the above) … and Book 3 (Repeat all of the above) … and not I’m editing Book 4 (currently repeating all of the above). Now when I edit, I find I’m finding the occasional typo, but not as many as I did in the earlier books. I think I’ve just been getting better with that. I’ll never be perfect though, I’m just a bad typist, and well … a terrible speller. So naturally I’m choosing to be an author! No, I think most of my edits now are adding better descriptive language and helping to foreshadow the plot of future books in the series. I designed each book to build on the last, to reveal more and more of the story in such a way that each time you read a book, you want to go back and read the previous books. If you do, I guarantee you’ll see the earlier books a little differently. Things that seemed like just a throw away comment will have a much deeper meaning later on. Well that’s enough about editing for today. I’m now going to refer all my friends to this post when I get the “What’s editing?” question again. Should save me a bit of time.